Mr. Godwin received his undergraduate degree at the State University of New York College at Fredonia in 1993. He attended law school at the State University of New York at Buffalo and received his law degree in 1998. He is admitted to practice law in the State of New York and the Commonwealth of Massachusetts. Mr. Godwin is also admitted to practice law in a number of federal courts including, the Western District of New York, the Northern District of New York, the Eastern District of New York, the Southern District of New York, the Eastern District of Michigan, the Western District of Michigan, and the District of Connecticut. 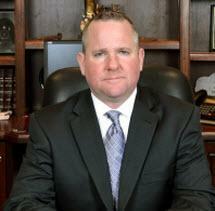 Mr. Godwin has focused on personal injury litigation since 1998. He has handled numerous cases within that field including: auto accidents, motorcycle accidents, construction accidents, product liability cases, and premises liability cases. Mr. Godwin has obtained numerous successful settlements and verdicts within these areas of practice. A large portion of Mr. Godwin’s practice also includes the representation of injured railroad workers and their families under the Federal Employers’ Liability Act. He has successfully litigated cases for injured railroad workers throughout the northeast and the midwest. Mr. Godwin has also developed a number of relationships within various unions in the rail industry and is a strong advocate for rail labor. He also has current family ties within the rail industry. Mr. Godwin’s father, Robert W. Godwin, Sr., hired on the Erie Lackawanna Railroad in 1958. He also began his career as a union representative in 1960 and served as the General Chairman of the Brotherhood of Locomotive Engineers for a number of committees from 1982 until his retirement in 2000.